Mariazell is a small city in Austria, in Styria, well known for winter sports, 143 kilometres (89 miles) N. of Graz. It is picturesquely situated in the valley of the Salza, amid the north Styrian Alps. It is a site of pilgrimage for Catholics from Austria and neighboring countries. The object of veneration is an image of the Virgin Mary reputed to work miracles, carved in lime-tree wood. This was brought to the place in 1157, and is now enshrined in a chapel adorned with objects of silver and other costly materials. The large church of which the chapel forms part was erected in 1644 as an expansion of a smaller church built by Louis I, King of Hungary, after a victory over the Turks in 1363. There is no trace of large or enclosed settlements in the area of modern Mariazell dating from pre-Christian times or the first century A.D. The large number of Illyrian and Celtic mountain and river names in the region, such as for example the Erlauf, however, suggest small settlements by these tribes. The salt springs in Halltal were not unknown to these groups. In 1025, Emperor Conrad II gave his sister-in-law Beatrix, married to Adalbero of Eppenstein, parts of the county in the Mürztale as a gift. With this gift came around 100 Huben,[clarification needed] which belonged to the territory of the future market of Mariazell. There was an argument for one year over this gift involving the Reichsgericht and even the Pope. Eberhard, Archbishop of Salzburg, decided in 1151 in favor of the Monastery of St. Lambrecht. 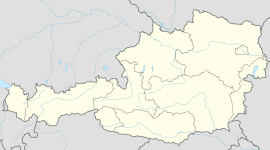 It was allowed to control part of the parish territory of Mariazell and of the dominion of Aflenz. The date, December 21, 1157, is taken off a document from Pope Adrian IV, still traditionally celebrated as the date of Mariazell's establishment, even though it cannot be proven historically. 1679: Emperor Leopold I visited the shrine, and a valet in his entourage brought the plague to Mariazell. Fear and terror took hold as 156 townspeople fell victim to the disease. 1683: Fears of a new Turkish invasion caused the holy statue as well as the treasury images to be sent to St. Lambrecht, from which they were returned later that year. 1742: The Empress granted Abbot Eugen Inzaghi the privileges of an Archabbot over Gollrad and Aschbach, as well as over the Mariazell cast iron works. In 1782, Joseph Haydn wrote the Mariazell Mass, for pilgrims to the Basilica in Mariazell. The mass was commissioned at the request of the pilgrims, through a military officer. In 1786, Emperor Joseph II dissolves the Monastery of St. Lambrecht, from which Mariazell was serviced, in the course of his cloister abolishments. The pilgrimages are hampered and later completely forbidden. In 1798, a conflagration destroys the town; the area of Wiener Straße is especially hard hit. 1805: The Battle of Mariazell is fought in the area during the War of the Third Coalition as the French invade Austria. 1809: Faced with a French advance in the War of the Fifth Coalition, church treasures are brought to Temesvár in Hungary for security. A few weeks later, the French arrive at Mariazell. Combat operations, requisition, and crop failures lead in these years to a massive decrease in population. 1966: The fathers of the Kremsmünster Monastery separate from the fathers of the Schottenstift, who had been in charge of the ecclesiastical leadership of Mariazell since 1949. In the following years, extensive restoration work is done on the church, the priory, and the nearby chapel. The new rosary path is also built during this time. The city coat of arms shows a black shield with a stylized depiction of the Gothic archway of the Mariazell Basilica in gold. Before it stands the gold-crowned Mariazeller Madonna with a similarly crowned Christ Child on her right arm. The Madonna wears a blue cloak and is wrapped in a silver-white robe, as is the Christ Child. The chests of both figures are adorned with a small cross. Mariazell lies on the highway B 20, which goes from St. Pölten over the Seebergsattel to Kapfenberg im Mürz Valley. There is a connection through the Salza Valley to the east either over the Gscheid to St. Aegyd am Neuwalde, into the Piesting Valley und then further into the Viennese Basin (B 21) or over the Lahnsattel into the Mürz Valley and onward to Mürzzuschlag (B 23). Mariazell is also the southern endpoint of the Mariazell railway line, a narrow gauge electric railway from St Pölten. However the terminus of the line at Mariazell station lies around 1 km (0.6 mi) north of the city center in the municipal territory of Sankt Sebastian. The station is also the terminus of the Museumstramway Mariazell-Erlaufsee, a standard gauge heritage steam tramway that operates to the nearby Erlaufsee. Mariazell Airport is a private use airport that is located 2 kilometres (1 mi) north-northwest of Mariazell. This article incorporates text from a publication now in the public domain: Chisholm, Hugh, ed. (1911). "Mariazell" . Encyclopædia Britannica. 17 (11th ed.). Cambridge University Press. p. 709. ^ "HAYDN, J.: Masses (Complete) (Trinity Choir, Rebel Baroque Orchestra, Burdick, Glover) (8 CD Box set)". ^ Bačić, Tomay (April 2015). "Mariazellerbahn: Modernised but still charming". Today's Railways Europe (232). Platform 5 Publishing Ltd. pp. 34–38. Wikimedia Commons has media related to Mariazell. This page was last edited on 25 March 2019, at 05:03 (UTC).